The Great East Japan Earthquake produced a huge tsunami, which struck and changed the coastal ecosystems along the Sanriku Coast in front of the epicenter. 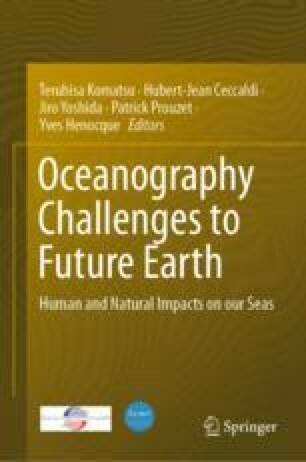 It is important to monitor changes in the ecosystems caused by this huge tsunami and their succession due to natural processes and human impacts, because tsunami events occur at intervals of less than 100 years in Japan. We have monitored the seaweed beds in Shizugawa Bay on the Sanriku Coast since October 2011. Our observations showed that the tsunami didn’t seriously damaged the seaweed beds on the rocky substrate. The sea urchins on the rocky coast were also not affected by the tsunami. These sea urchins were able to spawn in the summer of 2011, because the sea urchin fishery suspended work in 2011 and 2012 due to a lack of fishing boats and a possibility that sea urchins fed corpses of victims of tsunami on the sea bottom. In 2014, the sea urchins born in summer of 2011 started to feed on the kelp forests, particularly from the deeper Eisenia bicyclis beds. In 2015, they consumed most of the E. bicyclis beds, which have disappeared from the head of the bay. The kelp forests in the Pacific involve a trophic cascade consisting of sea otters, sea urchins, and kelp. The sea urchin fishery corresponds to sea otters, which maintain healthy giant kelp beds along the west coast of the USA. Therefore, the sea urchin fishery is a satoumi activity defined as the human management of coastal seas that results in high biological productivity and biodiversity. It is necessary to maintain kelp beds through the sea urchin fishery for realizing sustainable fisheries and a healthy coastal ecosystem. This study was partly supported by the Mitsui and Co., Ltd. Environment Fund (FY2011 Restoration Grants; R11-F1-060), by Tohoku Marine Science of Ministry of Culture, Sports and Education and also by S(9) and S(13) of Strategic Research Funds of the Ministry of Environment of Japan. The authors express sincere thanks to the late Mr. Norio Sasaki, former President of Shizugawa Bay Management Council of Miyagi Fisheries Cooperative, and Mr. Toshimitsu Sato and Mr. Fujio Abe, Head of Shizugawa and Tokura Branches of Miyagi Fisheries Cooperative for their help to conduct field survey.